Lake of the Woods is located in Van Buren County, Michigan. 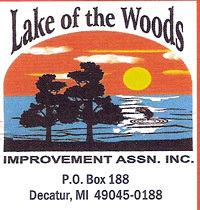 The Lake of the Woods Improvement Association seeks to protect and preserve our lake as it is an irreplaceable part of nature. We invite you to join us in our efforts and learn how you can help protect our beautiful lake. Those of us who use and enjoy the lake are responsible for its care. We have an obligation to leave the lake clean and beautiful for future generations to enjoy. We need your help in dealing with the increasing threats to our waters from over use, exotic plants and animals, and pollution from various sources. Working together we can make a difference.